Paul A Lunn is already familiar to many of us from his excellent layout design articles in the British model railway press. He is well known for his ability to fit a quart into a pint pot and Building Micro Layouts: Design Tips, Techniques and Project Plans gives a great insight in all the techniques that he uses to accomplish this. 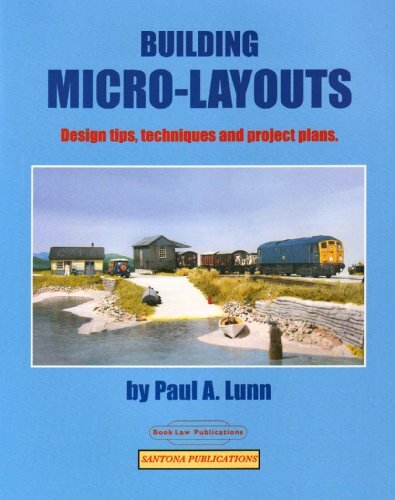 If you are contemplating building a very small layout this book by Paul A. Lunn fits the bill superbly. It may only be 64 pages, but it can sometimes be quality not quantity of information that proves to be a book’s worth. Paul has given great thought in the designs in this book and provides you with a vast array of information if you feel that micro modelling railways is for you. All the designs are aimed at the ’00’ modeller but could be scaled up or down as required. .Micro layouts and how to build them, this shows the benefits and advantages of micro layouts as well as generating ideas to presentation. Planning a micro layout, is your plan viable? Plans, themes and schemes, this shows 16 examples of plans, artists impressions and locations which could be used as inspiration, it also lists where you can get further information and reading for each of the plans used which I feel is a great idea. Building Micro Layouts: Design Tips, Techniques and Project Plans not only does what it says on the front cover but can be used in the making of larger projects. It could be used to give ideas for a small first project or even a display model for the exhibition circuit. A good writing style, excellent quality photographs and diagrams makes this as one of my favourite books on the subject. An excellent book which I most definitely give 5 stars.